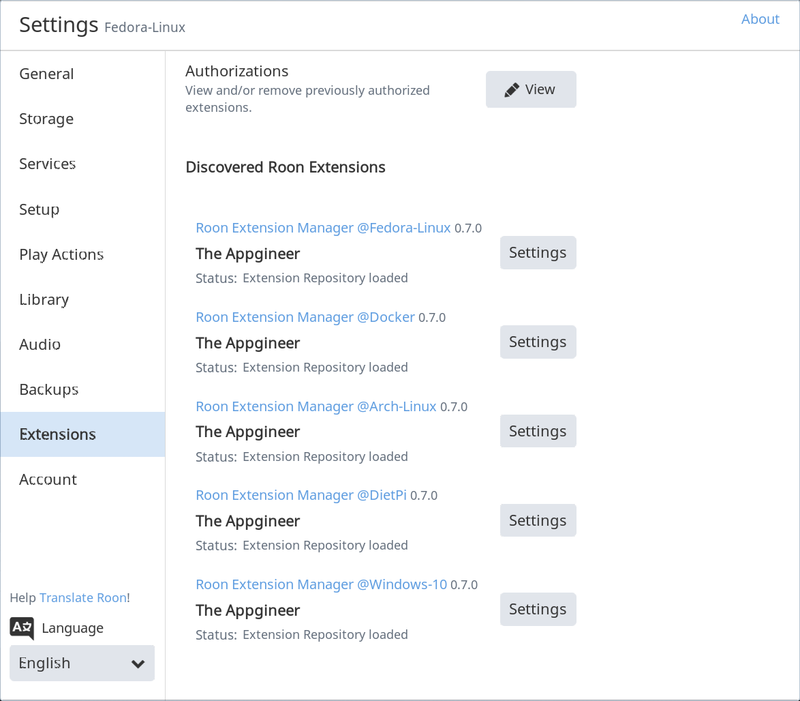 After installation the Extension Manager should show up in Roon, it can be accessed via Settings→Extensions. 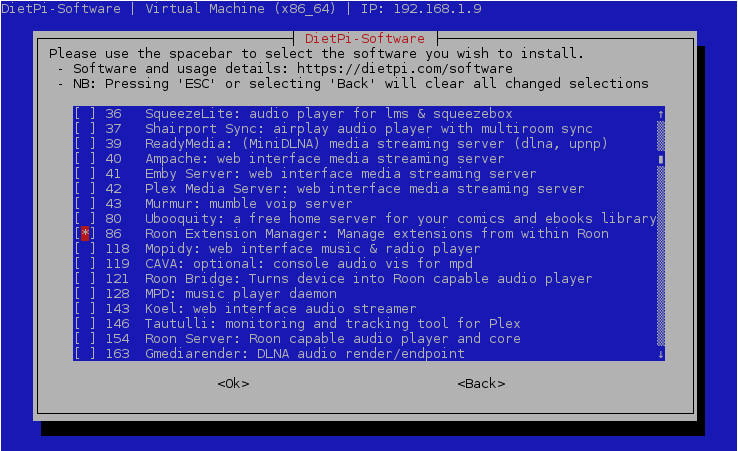 Installation can be performed via the dietpi-software installer, the Extension Manager can be found in the 'Media Systems' group within 'Software Optimized'. The Setup Script performs a prerequisite check, installs the Extension Manager and sets up a systemd service. It has to be run with administrator privileges. If you run it as a normal user with sudo (recommended), the service will run as that user. Installation is done in the home directory of the user. The script is pretty basic and has limited error handling. It is used successfully on Fedora, Arch Linux and DietPi but should work an other distros as well. Follow the generic installation instructions of the README file. Download the service file and change the paths in the WorkingDirectory and ExecStart field to the location of the shell script as setup in the previous step (use the absolute path here). Change the User field to the user name you use to run the Extension Manager. Make sure that the service file and shell script can be accessed by this user. Docker containers can be run on the more powerful Synology or QNAP devices, on a Linux PC by installing the Docker Community Edition, or on an ARM Single Board Computer (e.g. Raspberry Pi 2) running Raspbian or DietPi. The Docker image can be found on DockerHub, setup instructions are there as well. Windows installers, in both 32 bits and 64 bits, can be downloaded from the latest releases page. Please also read the information below the download links. The provided installer installs the Roon Extension Manager as a Windows service. Once running, you can install and uninstall extensions from within the Roon UI. Select Settings→Extensions from the "hamburger menu" in the upper left corner and select the Extension Manager. The service takes care that the Extension Manager starts when Windows starts, it is not necessary to login for the service to run. Run the installer as administrator, this is required for setting-up the service. Type cmd in the Windows search bar, right click the Command Prompt application and select Run as administrator. Open System Preferences -> Users & Groups and select your user. Click Login Items, click + and navigate to where your new application is saved. Roon Extension Manager is distributed under the Apache 2.0 license.